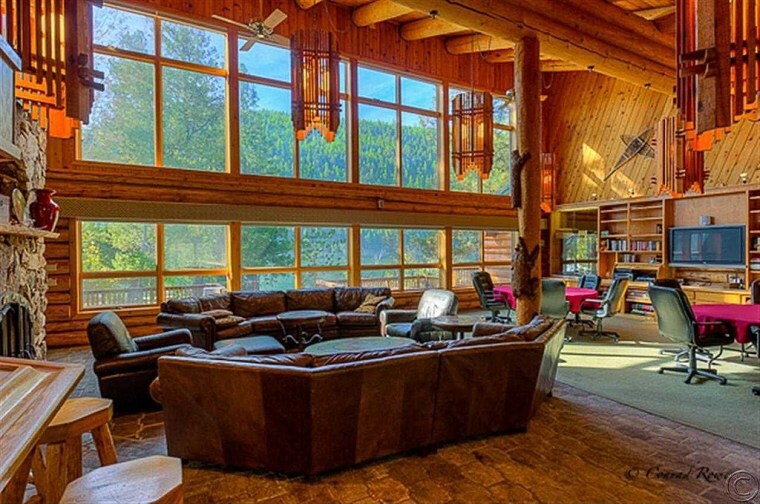 This 18,000-square-foot log home on a private island in Northwest Montana was built for a contraceptive-sponge millionaire in the 1980s, whose life later spiraled into tragedy. The University of Montana's fundraising arm has owned the property, operating it as a retreat, but has decided to sell it, listing it for just under $6.5 million. Even for Montana, the home is unusually secluded. Accessible in the summer only by boat or helicopter, the seven-bedroom, seven-bathroom log-cabin style retreat sits in the middle of 30-acre Sourdough Island on Salmon Lake. Want a car on the island? You'll have to drive it across the ice when the lake freezes each winter. "In Montana, it's extremely rare to find a private island on a lake," said listing agent Kevin Wetherell of Clearwater Montana Properties. The surrounding hillsides belong to the U.S. Forest Service, so the tree-covered hills, speckled with gold when the larch turn in the fall, will remain undeveloped. Every room has a view of the lake and backcountry. Inside, there are five rock fireplaces, a huge master suite, and a great room large enough for 30 guests. Bruce Vorhauer, who got rich manufacturing the Today Contraceptive Sponge, built the lodge in 1984. But the inventor's success didn't last, and he lost his money in a failed 1989 bid for U.S. Senate and a lawsuit over a tragic car accident. In a financial crisis, Vorhauer lit his Seattle yacht on fire in 1991 to try to collect the insurance, and lost his home to foreclosure. He ended up going bankrupt and committing suicide in 1992, according to a story about the lodge in The Missoulian. University of Montana benefactor and businessman Dennis Washington bought the foreclosed home and donated it to the University of Montana Foundation in 1995. It's been operated as a resort ever since, but Wetherell said he has shown it to celebrities and families who want to convert it back into a private retreat. The island includes a dock and boat storage, a two-bedroom shorehouse, and a helipad. Salmon Lake is on the southern end of the Seeley-Swan Valley, about an hour from Missoula. Emily Heffter, a reporter and writer for Zillow Blog, covers celebrity real estate, unusual properties, and other real estate topics. Read more of her work here.